This is the apple cake of my childhood. This is the only cake I remember from my childhood that my mum made. This cake makes me smile. My mum was not a huge baker, she preferred no bake, put it in the refrigerator desserts. She was always happy to try new desserts, but baked cakes were not her thing, except this one cake, and she made it often. But then she stopped making this also. So after years of not having this cake, I decided to make it myself. I got the recipe from my mum and made it. It took me right back to my childhood, it was such a lovely memory for me. And what made it even better is my family loved it as much as I loved it. This cake for me is amazing, so simple to make, yet so nice. The end result is a cake that is light and fluffy, but somehow in the baking process it develops a meringue like crisp top that I truly remember from my childhood, and every bite takes me back there. There are loads of apples in it, so it is moist also. 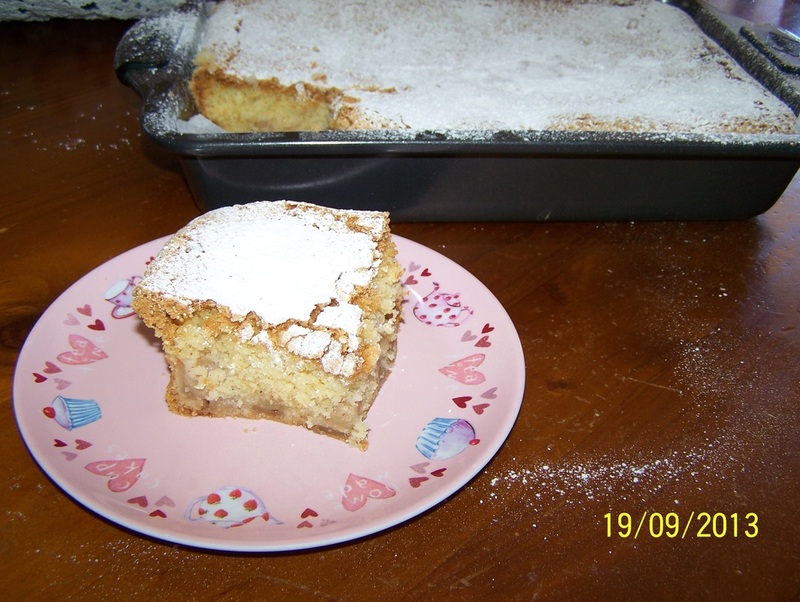 I have tweaked my mum's recipe a little, as I added cinnamon and vanilla to the cake. I hope you love it as much as I do. It can be served with ice cream, but I prefer it by itself as a tea cake. I also like it when it has completely cooled, not sure why, just do. Preheat the oven to 180C conventional/175C fan forced. Grease and line with baking paper a 30cm x 20cm (base measurement) baking dish. Place the diced apples in a large bowl, sprinkle over the sugar and cinnamon. I usually put 2 tablespoons of sugar at this stage. And cinnamon is to taste, if you like it add more, if you want a hint of it add less. Stir the mix together, so all the apples get cinnamon and sugar on them. In a large mixing bowl add the eggs and sugar. Whisk with an electric mixer for 4-5 minutes until the mixture is light and fluffy. Add the vanilla and oil, whisk until the oil is incorporated into the eggs. Add the flour and fold through the egg mixture. Add half of the cake mix to the base of your baking dish. Spread it out evenly. Squeeze out any excess juice from the apples, if there is any. And spread evenly over the cake mix in the baking dish. Now if the apples are really tart, you can add a sprinkling of extra caster sugar to the apples now, but it is not needed if the apples are sweet enough for you. Evenly spread the remaining cake mix over the apples. Bake for 1 hour and 30 minutes. Remove from the oven, leave to cool in the baking dish. 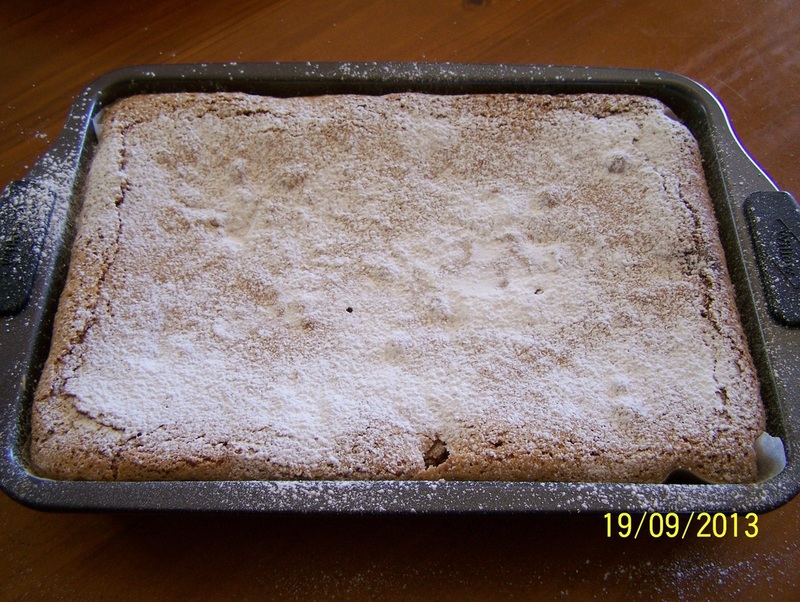 Dust with icing sugar before serving. Grease and flour this type of cake pan, or your cake will stick to the pan and not come out. Also not all of the cake mix and apples will fit in the pan, fill it to 3/4 full only as it will rise, make cupcakes out of the extra mix.